Rain. High 68F. Winds SSE at 15 to 25 mph. Chance of rain 90%. Rainfall near a quarter of an inch. Higher wind gusts possible..
Overcast with rain showers at times. Low 37F. Winds W at 15 to 25 mph. Chance of rain 70%. Higher wind gusts possible. Mike Sigona is the owner of Thirsty Pug Craft Beer Market, a new specialty beer store in Genesee Center. Thirsty Pug Craft Beer Market, a new specialty beer store in Genesee Center, offers a variety of craft beers that are becoming popular on the market. Thirsty Pug Craft Beer Market, a new specialty beer store in Genesee Center, has a chalkboard wall with suggested craft beer alternatives to traditional popular beers. 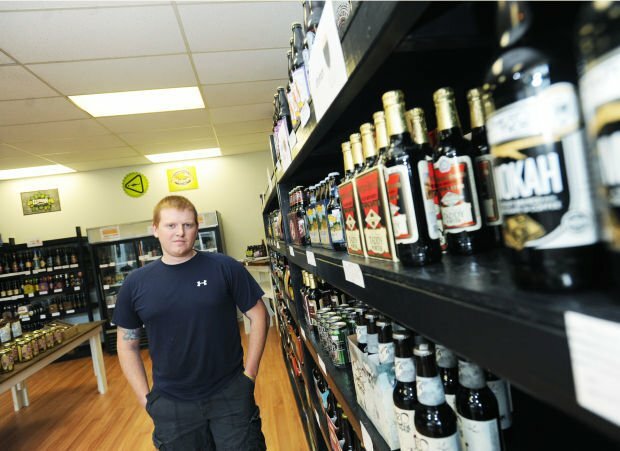 Thirsty Pug Craft Beer Market, a new specialty beer store in Genesee Center, offers a variety of craft beers that are becoming more popular on the market. AUBURN | Ever wanted to try a sour beer? 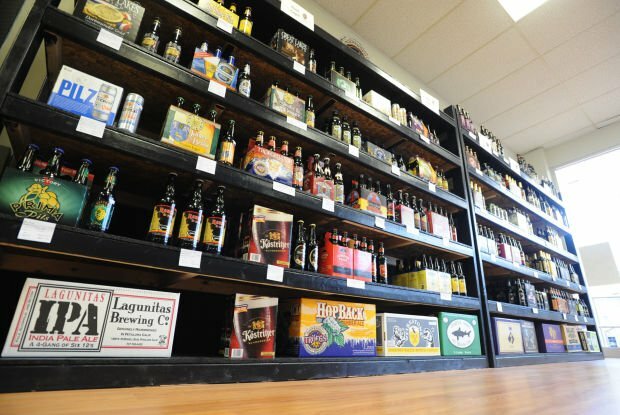 Such adventurousness could set you back several dollars and leave you with five and a half unwanted bottles, but it doesn't have to at Thirsty Pug Craft Beer Market: The new Genesee Center store, which opened June 13, offers single-bottle sales. "It's for people to experiment without investing a ton of money in something they might not enjoy. It's much less intimidating trying something new," said owner Mike Sigona, 29, of Auburn. Sigona opened Thirsty Pug after several years of kitchen experience at places like the Cascade Grill in Moravia. The long hours in that profession held him back from his own attempts at brewing, he said. With Thirsty Pug, though, Sigona's longtime passion for beer and business ambitions blended in the right proportions. Genesee Center proved a viable site to him, he said, so plans for the store began fermenting in January. "The industry's growing rapidly. We got two brewers coming to town," he said, referring to Prison City Pub & Brewery and Shepherd's Brewing Co.
Sigona has the final say in Thirsty Pug's selection, which rounds up popular craft companies like Dogfish Head and Great Lakes with many lesser-knowns, and counts Guinness among the few heavyweight brands it carries. "It's pretty much well agreed-upon what the top-rated beers are," he said. "It's highly subjective, but so is music. And you can definitely make an argument that Led Zeppelin is better than Justin Bieber." For those who come in looking for Bud Light or Coors, the chalkboard wall behind Sigona's counter suggests what Thirsty Pug products they'd enjoy. Custom shelf labels detail each beer's qualities, too, from alcohol content to flavor notes. Preserving the beers' intended taste is another priority for Sigona. He custom-fitted his cooler lights with covers that block the UV rays that often cause hoppier beers to become skunky in flavor, and regularly rotates his stock. "A lot of beers don't age well. When you have a thousand different things on the shelf, a lot of those things aren't going to be good four months down the road," he said. "I don't want anyone leaving with an oxidized beer, or having a bad experience due to a retailer making a mistake." Sigona hopes the establishment of breweries in the Cayuga County area helps Thirsty Pug take root with the Finger Lakes Beer Trail and the regional craft beer enthusiasts it attracts. "It is such a great community," he said. "We're all in the craft beer scene together." Lake Life Editor David Wilcox can be reached at (315) 282-2245 or david.wilcox@lee.net. Follow him on Twitter @drwilcox. Trappist beers (Orval, Trappistes Rochefort) — "Production is overseen by Belgian monks and they have to be made within abbey walls. They're some of the best, most highly regarded beers in the world. It seems crazy to me that everyone's not carrying them. Sours (Monks Cafe) — "I'm an (India pale ale) fan, but sometimes it just ruins your palate. Even in between IPAs, when I'm trying something new, I'll have a sour sitting around and have a few sips in between, it kind of gives you a fresh perspective." Lagers (Jack's Abby Brewing) — "These guys turn lagers on its head. They're taking them and they're doing their IPA versions of lagers, so it's still really well-hopped, lots of those citrus, tropical notes, but you get a smoothness from the cold conditioning that's just unparalleled by the ales." Ciders (The Dude's Rug by B. Nektar Meadery) — It's a "Big Lebowski" reference, and it probably sells enough just having that, but it's a blend of a chai tea and a cider. It's a really interesting and really cool drink." Thirsty Pug Craft Beer Market will host two tasting events this week.